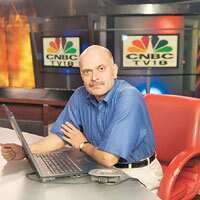 Filling space: Raghav Bahl, managing director of Network18. Network18, one of the country’s large TV groups, and Jagran Prakashan Ltd (JPL), the publisher of the country’s largest read Hindi daily, ‘Dainik Jagran’, announced a 50:50 joint venture to publish a business newspaper in Hindi. “The Indian economy is growing at a significant pace. There is a growing interest in the overall business environment and stock markets among people in tier I and tier II towns. But there is no newspaper catering to this consumer group. It is, thus, the most opportune time to fill this space," said Sanjay Gupta, CEO, JPL. The Hindi business daily will be launched next year, followed by other regional business dailies, said Gupta. This is the second joint venture between the two partners. Global Broadcast News Ltd, a group company of Network18, and the promoter family of Jagran run IBN-7, a Hindi news channel, under a joint venture called Jagran TV Pvt. Ltd. The new joint venture underscores Network18’s aggressive expansion into print media. On 12 December, the group announced the acquisition of a 40% stake in Infomedia India Ltd, a publisher of special interest magazines and business directories. And on 13 December, it announced a partnership with Forbes Media, a US-based business publisher, to launch ‘Forbes’ magazine in India. The partnership includes a content licensing arrangement and introduction of other Forbes products. “In recent years, business audiences have grown immensely in the Hindi heartland and regional markets, reflecting a democratization of enterprise and wealth creation across the nation," said Raghav Bahl, managing director, Network18, in a statement issued late Tuesday evening. The joint venture will be funded through an initial equity infusion from both sides followed by internal accruals and debt financing in the later stage, said the two partners.